For as long as I can remember, the beginning of autumn has always felt like the start of something exciting. Much more so than January 1st. Much of it is because I loved school and university and I was always excited to get back and catch up with friends. I liked getting a new timetable and new exercise books. It was a new beginning, a fresh start, a turning point in the year. Although that same back-to-school feeling isn’t quite the same, I still enjoy this time of year immensely. It’s my birthday in early October, which signals the start of Party Season. The mornings are often bright and crisp. The sunshine, although weak, still lifts the spirits. And it’s easier to sparkle sartorially once the nights have drawn in, although, the time of year has never reeeeally dictated when I wear sequins or glitter. I don’t refresh my wardrobe on a seasonal basis, nor do I routinely invest in a new range of new beauty products. I just add things as and when I desire. My skin generally behaves the same all year round, so there is no necessity to switch products. I simply enjoy trying new things and welcome the opportunities that I get to do so. Each of these autumn beauty recommendations were sent to me to try and review. As always, I have been using each and every one of them regularly over the last few months. It isn’t a sponsored post though- I haven’t been paid to write it. And it is nigh on impossible to describe or demonstrate measurable results, especially with skincare. So what I share are my own honest opinions, written in the way I would tell a friend. Manuka Doctor is a New Zealand company that uses honey harvested from its own hives. The Hydrating Cleanser has the consistency of a fine balm and it rubs into the skin very easily. I use a muslin cloth and warm water to remove it and it does a very good job indeed with minimal effort on my part. My skin doesn’t feel tight afterwards which is always a good sign. I like this product a lot and will buy it again. Normalising Facial Oil is an omega-rich facial oil that you apply after cleansing and before moisturising, morning and night. This oil does absorb easily, but I would advise applying an hour before bed, because it does leave a slight residue. I found it looked too oily for daytime use, but as a night treatment, it’s lovely. The very act of massaging it into my face at the end of the day is a treat in itself and is now something I do twice a week. The Overnight Lavender Mask is my hands-down favourite of all of the Manuka products I tried. As you’d expect, you apply it at night time. I love anything that smells of lavender, and I really do find that it’s a scent that calms and soothes me. This smells particularly divine and the product itself is excellent. It isn’t a mask that dries or stays on the surface of the skin, nor does it need removing. You simply massage it in after cleansing. It contains hyaluronic acid which is of course, excellent for helping the skin to retain moisture. It’s so difficult to measure any results, but I can say that my skin always feels lovely and soft the morning after I have applied it. (Unlike the nourishing oil, it doesn’t leave a residue on pillow cases either). I love this product so much and have to stop myself from using it every single night! I use it three times per week and will definitely buy it for myself once I’ve finished this one. This is the joint favourite of my autumn beauty recommendations. Restoring Night Cream is another gorgeous product. It’s quite a thick cream, yet is lightweight and easy to apply. It has a fresh scent which is quite soothing so is ideal for a night cream. Again, in the absence of measurable results, I will say that it feels incredibly comfortable and my skin seems to like it! This particular range caters for thick, wavy hair that is prone to frizz. This describes my hair to a tee. I wash my hair every day and on most days blow-dry, then straighten it. On those days, my hair initially looks quite smooth and sleek. However, the merest hint of moisture makes it kink. In its natural state, or when I don’t straighten it, it’s wavy. My hair is not the type to stay put and at times looks really quite crazy. therefore, all things considered, I was very much looking forward to trying this range. 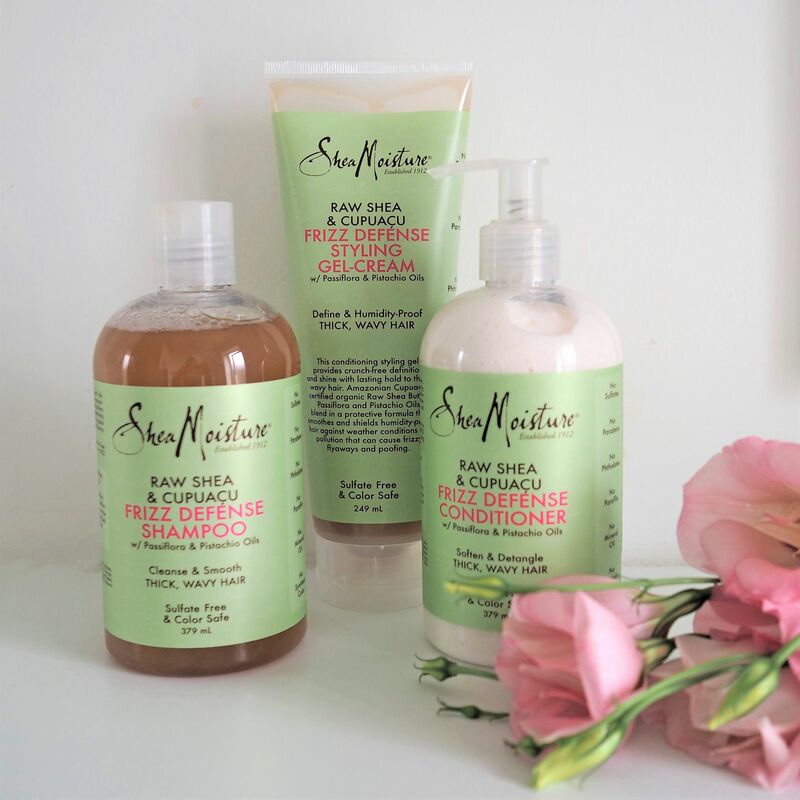 All three of these Shea Moisture products: the shampoo, conditioner and the styling gel-cream contain shea butter. They are free from sulphates, parabens, phthalates, paraffin and mineral oil. They all smell delightful- quite sweet- but the conditioner smells good enough to eat! It reminds me of marzipan but not in an over-powering way. The shampoo is light and I have found that I need only a little to get a good lather. The conditioner is lightweight and I can tell what a difference it makes when I comb my wet hair. It makes it so much easier to detangle and my hair feels immediately smoother after use. I have been particularly impressed with the Shea Moisture Frizz Defense Styling Gel-Cream. In fact, it is my other joint favourite of this selection of autumn beauty recommendations. You only need a tiny amount which you comb through wet hair. It’s lightweight and non-sticky and it really does smooth and tame the flyaways. Not only that, when I leave it to dry naturally, it doesn’t go “crispy” in the way that other products do. It makes my hair look intentionally wavy and I really like that. This is a hero product and again, I will buy this myself once this runs out. The Rosehip and Roseapene range from Trilogy is one of those that looks very professional on the shelf. By that, I mean it looks like a salon-only range. I can’t deny that this appeals to me a lot. But, are the products worthy of their packaging? 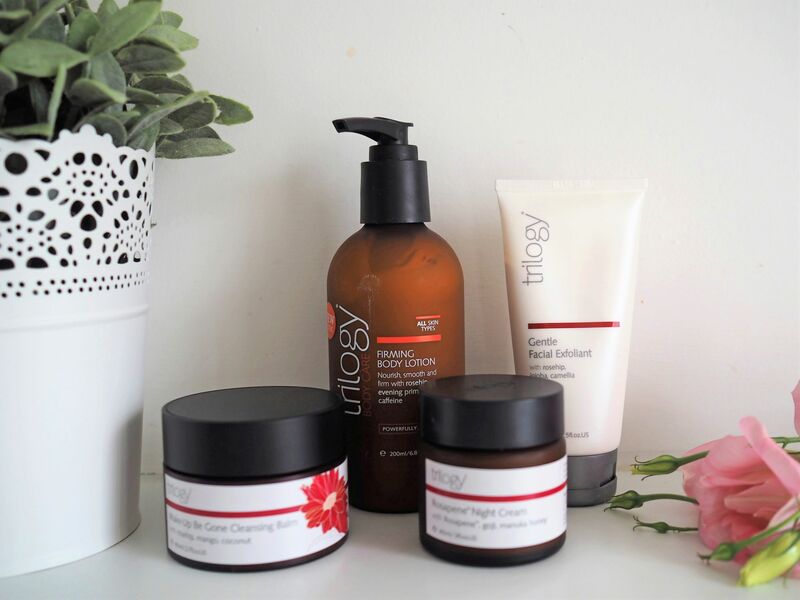 The Trilogy Make-Up Be Gone Cleansing Balm is lovely. Unlike the Manuka Doctor cleanser, this is a solid, waxy balm which comes with a cleansing cloth. It takes a few seconds for it to melt enough to rub into the skin and because of that, it feels like more of a treatment, than a “normal” cleanser. It glides across the skin and removes make-up effectively and efficiently and I enjoyed using it. The Gentle Facial Exfoliant contains evening primrose and rosehip oils as well as jojoba microspheres. It’s delicate and gentle and I feel an immediate difference in my skin after using it. Unlike a lot of exfoliators, it doesn’t feel too abrasive or too harsh. This is another product I will buy for myself. The Rosapene Night Cream comes up smelling of roses. Quite literally. Rose is another of my favourite scents, so I was pleased when I opened it. It’s very smooth and feels like it is the skin nourishing too. It does leave a slight residue which might not be for everyone, and truthfully, I can’t tell if it has made a noticeable difference, but as I said. I love anything that smells of rose and I enjoyed using this product. My final autumn beauty recommendation is the Trilogy Firming Body Lotion. I’m a little lazy when it comes to applying body lotion so the fact that it is pump action is a very good thing. It makes the whole process much speedier and more enjoyable. The lotion is easily and quickly absorbed and I can get dressed immediately without any residue transferring onto my clothes. Again, I can’t honestly say if my skin looks any firmer, but it definitely feels softer. The skin on my legs had been a little dry since my holiday and this lotion has managed to sort that out-They look an lot better than they did two-weeks ago! Talking of the new term, I’m starting a beginners Spanish evening class next week. It’s been on my to-do list for almost two years and I finally got around to booking it. I’ve been using a brilliant free app called Duolingo for a few weeks now to learn the basics, because I’m a complete beginner, and it’s excellent. So, I guess I do have that back-to-school feeling! All of these beauty and hair products were gifted. This is not a sponsored post. All opinions are 100% honest and all content is my own. Thank you for supporting the brands that support my blog. 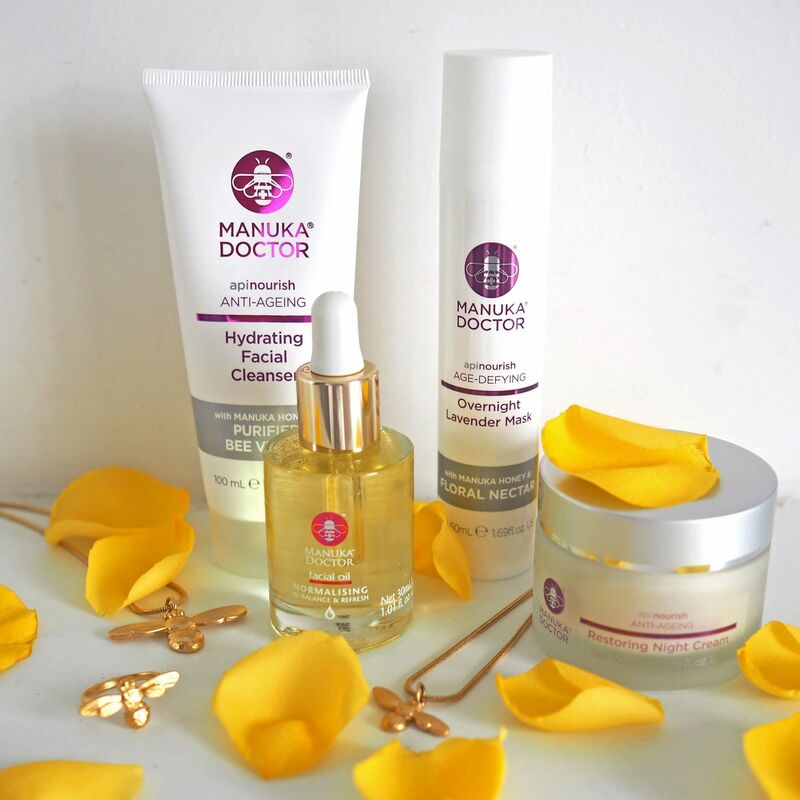 The Manuka Doctor products look and sound amazing. I love trying out new skincare. I have read a few reviews about the normalising Facial Oil so fancy giving that a try.